Use parameters to configure your push-notification for your needs. Private key and message are required, all other are optional. Your private or alias key (required) is required for authentication each time a push notification is sent. You can find it in your Pushsafer dashboard. Alias Key, you can set and use with predefined parameters. This parameter controls to which devices or device groups the message is sent to. The desired ID can be found at the respective device or group. Message / text of the push notification (required), max. 5000 characters, but the push notification will show fewer characters depending on the system. The client APP shows all characters. Ringtone / Sound which should be played when receiving the push notification. If the parameter is not passed or left blank, the device plays the default sound. If 0 is passed, the notification is silent! Otherwise you can pass a value from 1 to 50. The following sounds are available. For Windows 10, only the 24 native sounds are available. How often the device should vibrate when receiving a push-notification. blank=device default or a number 1-3, this parameter is due to the system only supported by iOS & Android. Instead of the default Pushsafer icon, which is displayed with the push notification, you can choose between 177 other icons. Simply pass the desired number 1-177 to the parameter i. It can be filtered by the icon in the client APP. With this parameter you can set the icon color in the Client APP. For this, a hexadecimal color code (example for red: #FF0000) must be passed to the parameter c.
in Android >5.0, the APP icon in the push notification is colored in the desired color. Furthermore, this value can set the luminescent color on Android smartphones, which have a (RGB)-LED for notification. Optionally, pass a URL to the parameter u. This URL can be opened directly from the push notification or from the client-app. Links are opened in the systems standard browser. Instead of an URL, URL schemes can also be transmitted. URL schemes open other APPs if they are installed on the device. Here are some examples of URL Schemes. Describes the title of the URL. If this parameter is not passed, the URL title is equal to the URL. Only affects the display in the client APP! These 3 parameters are used to transmit images. p is displayed directly in the push notification. p2 & p3 on the other hand only in the client app. The transfer must be done as Base64 encoded DataURL. To convert images (JPG, GIF & PNG) to DataURL, the tool Image to DataURL is available. Time2Live specifies how long a message should be kept in the client APP until it is automatically deleted. 0 or empty = do not automatically delete, an integer value 1-43200 the time in minutes before automatic deletion. You can set a priority parameter pr for your push-notifications. This priority value determines where the push notification will be put in the notification shade (this sorting affects Android devices only). That means - notifications with a high priority are displayed above a notification with a low priority, independent of when the notification was received! When the priority parameter is specified with a value of -2, messages will be get the lowest priority and will not generate any push-notification, but the message will displayed in the client-app. When the priority parameter is specified with a value of -1, messages are given a lower priority. Push notifications are sent normally. These messages do not triggered sound and vibration. If the priority parameter is specified with a value of 0, messages are given a normal priority. Push notifications are sent normally, quiet hours will be considered. These messages triggers sound and vibration as specified in the parameters. If the priority parameter is specified with a value of 1, messages are given a high priority. Push notifications are sent normally, quiet hours will be ignored. These messages triggers sound and vibration as specified in the parameters. If the priority parameter is specified with a value of 2, messages are given a highest priority. Push notifications are sent normally, quiet hours will be ignored. These messages triggers sound and vibration as specified in the parameters. 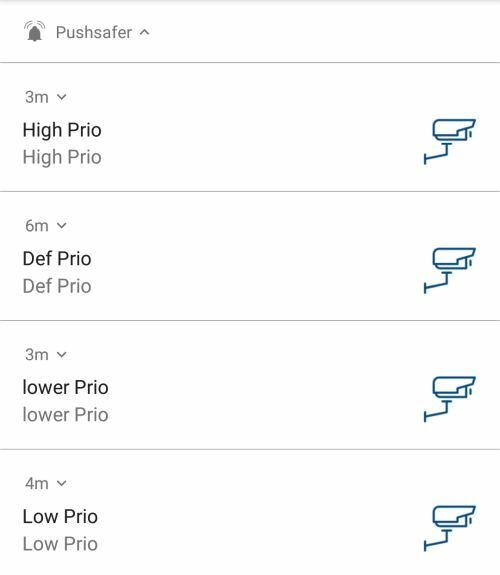 in the client App you can select for each priority value a free color, you also can filter the message list by priority. With the retry / resend Parameter re, a message will be resent after a certain time (60-10800 seconds, 60's steps). Resending can be stopped by opening the message in the Client APP or on the Pushsafer website or using the parameter ex. Each resending requires an API call! The ex parameter stops resending push-notifications after a specified time (60-10800 seconds). a message should sent again every 2 minutes for two hours. The following values must be passed! To respond to push notifications, pass the a parameter with the value 1. 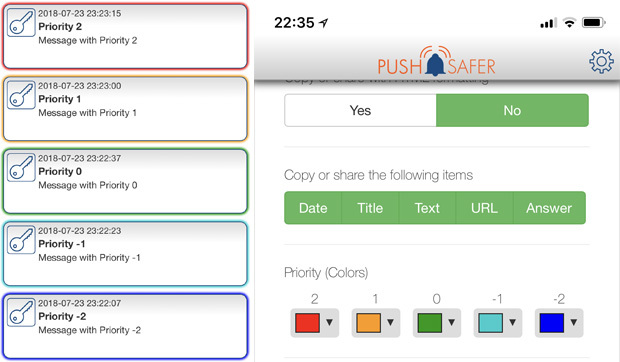 Answers can be written or viewed via the Client APP or via the Pushsafer website.